How grim can a movie get before it starts to feel like a slog? Justin Tipping’s Kicks doesn’t seem designed to provoke or answer that question. It’s well made, compelling, and no more of a miserablist wallow than any number of film-festival refugees. Yet the movie’s persistent grimness keeps compounding in a way that starts to feel like an end unto itself. Here is a film that manages to be observant without being especially insightful—without deepening thematically beyond the observation that inner city life can still be really, really lousy for everyone involved. The lousiness does shift as the movie proceeds, offering additional perspective on how much worse things can get. At first, Brandon (Jahking Guillory), a shrimpy teenager living in Oakland, laments his mother’s inability to pony up for a new pair of sneakers—specifically, a new retro line of Air Jordans. When fate smiles upon him in the form of an opportunity to buy his own, the shoes are quickly stolen by the older, meaner Flaco (Kofi Siriboe) and his buddies. Incensed, Brandon enlists his friends Albert (Christopher Jordan Wallace—son of The Notorious B.I.G.) and Rico (Christopher Meyer) to track down the shoes and steal them back. On paper, this sounds like a gritty romp in the vein of Dope or Gimme The Loot—urban capers with undercurrents of real menace. 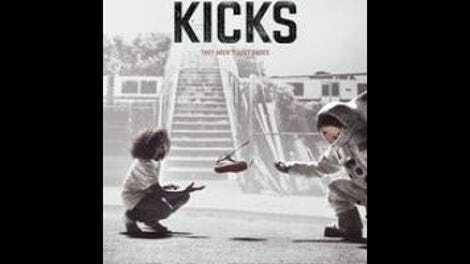 But Kicks strikes more mournful, heartbreaking notes than either of those movies in its details alone. Brandon’s friends aren’t just reluctant to join his mission; they barely appear to like him all that much. Flaco isn’t just a local hood, but a terrifying figure who practices the kind of protectiveness toward his children that could also constitute gross negligence (if gun-near-a-baby counts as a subgenre of social realist films, this is very much a gun-near-a-baby type of movie). And this isn’t just a scrappy mission to retrieve some shoes, but a harrowing, potentially violent conflict. Sometimes that’s admirable; the movie’s refusal to allow more than the tiniest slivers of humor to stick in this premise rebukes an audience that might well expect a more farcical story built around the theft of a pair of sneakers. This isn’t a game, Kicks says. Fair enough, but Tipping’s relentlessly downbeat vision also makes his movie difficult to hook into, beyond the late-breaking exercises in violence-threatening suspense. Before it gets to its suspenseful gun-near-a-baby final stretch, Kicks is also an 80-minute movie that feels substantially longer, thanks in part to a lot of slow-motion cinematography by Michael Ragen (who won a prize at this year’s Tribeca Film Festival for his work). Some of these flourishes are poetic and otherworldly, like Brandon’s recurring vision of an astronaut who could float up and away from the perilous streets where he lives. Sometimes, though, they’re just plain slow. That slowness doesn’t completely diminish Tipping’s attention to small-scale drama where other movies would have gone bigger and noisier, and it certainly doesn’t take away from the fine, naturalistic performances of his young cast, particularly Guillory. But it does sometimes make Kicks feel like an essay with a padded word count, hoping that enough sad stuff—14-year-olds drinking and smoking; a generally nonviolent kid willing to pick up a gun; savage beatings—will add up to a profound statement.